One of my best buddies during high school years was Jim Stiles, whose folks were kind enough to send him off to college driving a brand new MG TC. There, he became friendly with a professor who enjoyed sports car racing to the level of going faster than he was allowed on public roads and safe enough at the back of the pack wearing a football helmet to protect his cranium. Jim, like too many MG TC owners, failed to heed that big red dashboard light warning of low oil pressure and scored the cylinder walls badly. Knowing Jim had caught the racing bug, the service manager at his Mineola, Long Island dealer suggested an unfair advantage long before Roger Penske though up his very first one. The MG's 1250cc engine was pretty much in the middle of the SCCA Class F displacement range, so let's bore it out as close to 1500cc as we can without making a hole in the water gallery. That ploy was polished further with replacing factory plywood with a much lighter aluminum floor, aluminum front motorcycle fenders, removing hood side panels and stiffer shock absorber settings. Pits amounted to bring-your-own wood tables in the grass a few feet off the paved road’s racing surface. Jim Stile’s back is to viewer in the white coveralls with my new wife to his right wearing a dark jacket. All this was completed about a week before the June 9th 1951 Bridgehampton road races. The empirical testing of modification results came from a drag race between the MG and the dealer's own 2½-litre Riley roadster...Jim's MG won. But there was still a need back in those days for gentle break-in of the modified engine. So Jim asked me to share an effort to put 500 miles on the odometer by driving the back roads of Long Island at 35mph all night long. Starting late afternoon, I was comfortable as passenger even though a small Brooklands deflector in front of the driver had replaced the original windshield and the upsweep of the scuttle kept very little of the breeze from being a facefull even at our slow speeds. We'd drive for an hour, stop for coffee and change sides, while discovering it was getting colder and had become about as exciting as watching paint dry. Driving behind the mini-glass became preferred position. But, when dawn arrived and we stopped shivering, there were a bit over 300 new miles on the clock. Jim even reversed his headlights for smoother air flow. 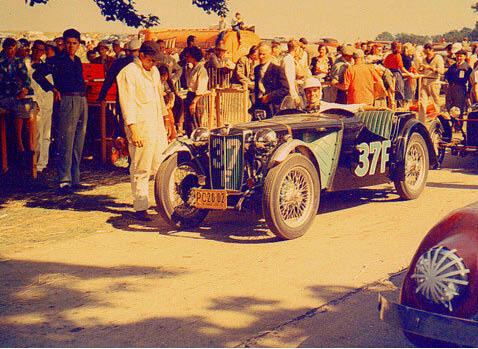 He’s flanked by Bob Grier’s BMW 328 on his left and Fritz Koster’s HRG on the rear bumper. Jim was entered in the preliminary race, flanked on one side by Bob Grier's pre-war BMW roadster with Fritz Koster's 1500cc HRG on his rear bumper. The more experienced Koster got by in short order, but Jim stayed in his slip stream as both moved up through the field. Finally, Koster was leading on the last lap with Jim still on his tail. Suddenly the HRG’s carburetor malfunctioned and Koster's power faded allowing Jim to pass and win his very first race. 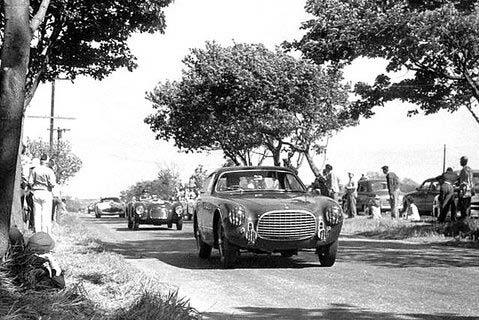 Spectator safety was not a serious concern 63 years ago, as the relaxed fellow under that roadside tree will confirm. That win qualified Jim for the 25-lap 100-mile feature race, in which he finished a respectable 12th overall and 2nd in Class F among 19 entries. And yes, he did go on to race elsewhere, but I moved from Long Island to a new upstate New York job and lost track of Jim. Wonder where Jim is today? If you look carefully, Jim's #37 car flashes by the camera in this elderly motion picture film of the same race. "Excellent footage of Bridgehampton 1951. 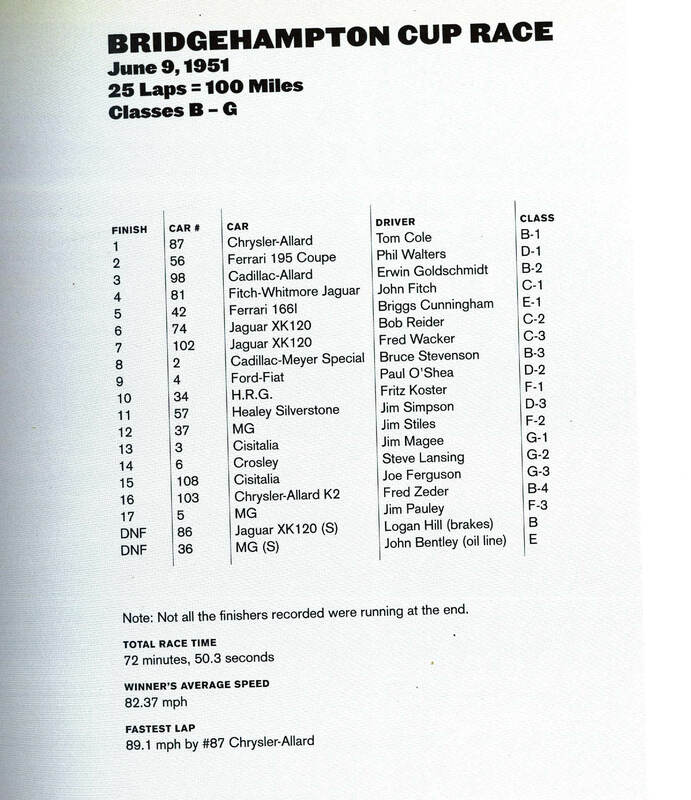 In the mid-‘70s Austin Clark offered to house my # 69 ex-Frank Dominianni race car at his museum. 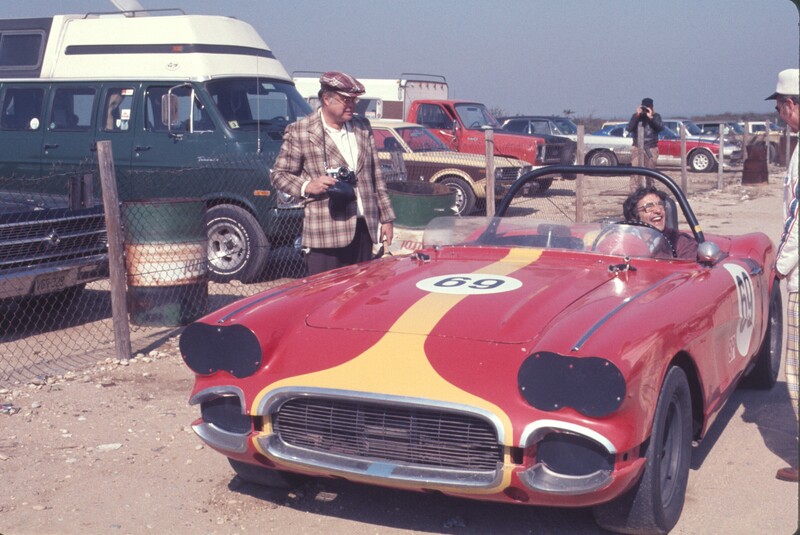 This photo shows Austin, Frank and car at 1976 IMPA press day at Bridgehampton. Please feel free to share. " Thanks for the memories, Howard. Just a reminder; the 21st annual Rally and Show at the Bridgehampton Museum is Oct. 4, and while we’d love to see you and The Beast there again, we understand if other commitments come first. However, we’d still like to do something special for Mustang’s 50th anniversary if you can suggest anything. Mustangs figured prominently in Bridgehampton’s later history during the TransAm and Double 500 days. I believe this is the same Rog that wrenches on Chasing Classic Cars show on Velocity network. And that MG in the hay bales was driven by a famous reporter from CBS News. Anyone know who? I want to sat Walter Cronkite but not sure? The film is a treasure. On the featured event, the hundred mile race, at the start on the second row inside is a car called the Meyer Special #4. This car was driven by my father, Bruce Stevenson who died in 2007. He co-founded the Bridgehampton races with Austie Clark. 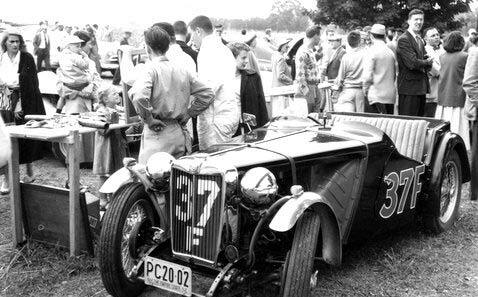 Originally it was an MG event starting back in the late 40s, which eventually became an SCCA event. My father often talked about the races in the late 40s and early 50s in Bridgehampton, Linden, NJ and of course, the granddaddy of them all at the time, Watkins Glen. They were an extraordinary group of gentlemen. Just back from WWII, they were this country’s greatest generation and knew how to get things done and enjoy their efforts immensely. There will never be another generation as vibrant. Thanks as always for these great memories. I am always grateful to those who share them as it was such a wonderful time and I agree there will never be anything like it again.